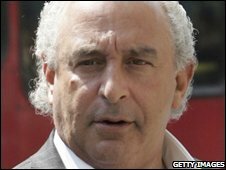 Sir Philip Green, the billionaire owner of Topshop and BHS owner, has said he will decide soon whether to make a bid for the menswear chain, Moss Bros. He has just bought a 28% stake in Moss Bros for £6.7m ($10.1m) from the troubled Icelandic investment group, Baugur. Sir Philip said he would consider bidding "in the next couple of days". He said Moss Bros - which owns brands such as Moss, Cecil Gee and Hugo Boss - was "attractive" as it was debt-free. The purchase of the stake in the menswear and hire chain was decided quickly. "I got a call about this 15 hours ago, they [Baugur] said, 'This is what we want to do,' I said, 'Fine, we'll do it,'" he said. In May, Baugur abandoned its own plans for a full takeover bid for Moss Bros. In October, Sir Philip held talks with Baugur, Iceland's government and banks, with a view to acquiring much of the investment group's debts. Buying Baugur's debts would give Sir Philip considerable influence over the group's British fashion interests. The Icelandic group also owns stakes in Debenhams, Woolworths and French Connection. Sir Philip said buying the stake in Moss Bros did not represent a change in focus from Baugur's debts. "We're looking at all sorts of things on a daily basis. We've just got to find things we think can create or add value," he said.